A new urban hospital was an exciting contribution to the community. The facility was new, they had the latest equipment and top medical staff. Nevertheless, in the first couple of years, problems began to surface. Traditional town halls, team-building, leadership training, action campaigns, and engagement efforts were not getting any traction. It was clear to the CEO, they needed breakthroughs in both results and behaviors – and they needed them quickly. Establishing their own Strategic B STATE Roadmap, the SLT created a shared Picture of Future success and a new set of leadership “habits” to drive change. By identifying their external business drivers, the SLT instantly unified around a new Mindset, new Collective Habits of Execution, and Shared Priorities. The SLT then identified and communicated 7 critical shifts in the role of department (middle) managers. Using the B STATE Team Accountability System, they provided forums, support, and time for the department managers to “pick up the reigns” in leading priority initiatives and resolving day-to-day issues as a team, taking shared ownership and accountability for success. B STATE Proactive Recovery System to respond and adjust quickly as a team. By creating and updating their Strategic B STATE Roadmap, the hospital continued to transform itself year-after-year as three new major opportunities and challenges presented themselves, demonstrating their ability to dynamically sustain success. 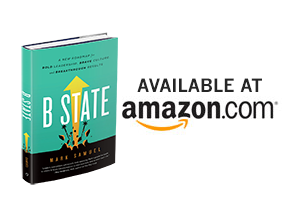 Read the whole story – click here to order Mark Samuel’s B STATE book. and to achieve breakthrough results year after year? We can help. Click here to get started.